Everyone will be afraid to come up to your house with the Swinging Skeletal Boy around! 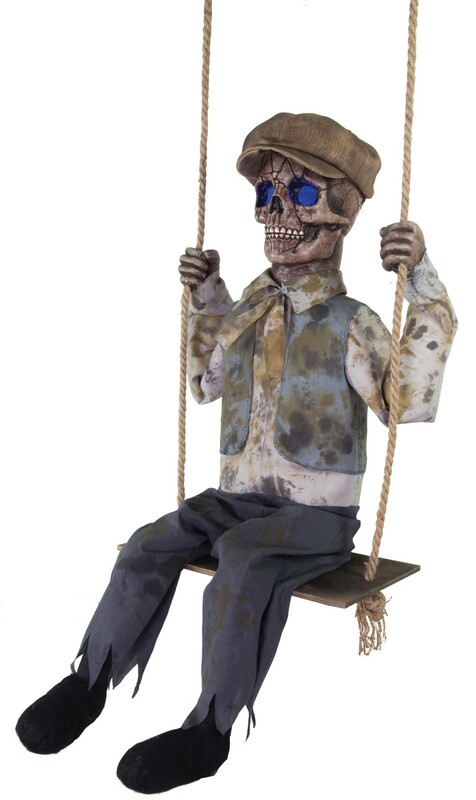 This creepy prop features a Victorian-era skeletal boy with hollowed out eyes that glow an otherworldly blue, and speaks haunting phrases to all passersby, as his head turns side-to-side while he swings back and forth on his swing. Your haunted house will never be the same with the Swinging Skeletal Boy! Animation: eyes glow blue, head turns side-to-side, swings back and forth on swing. Activation options: steady-on, infra-red sensor (works up to 6.5 feet away and works in all lighting conditions), step-here pad (included). Power: UL power adapter that plugs into any standard outlet. Materials: polyester, PVC, sponge, plastic, hemp rope, electronics. Assembly required.